From McDonald’s Restaurant, walk (or catch tram number 3) up Kohlenberg for approximately 200 metres, following the route of the tram. Just before the Musik-Akademie tram stop, turn right into Leonhardskirchplatz and then bear right again. Ahead of you is an arch on which the word “Lohnhof” is written. 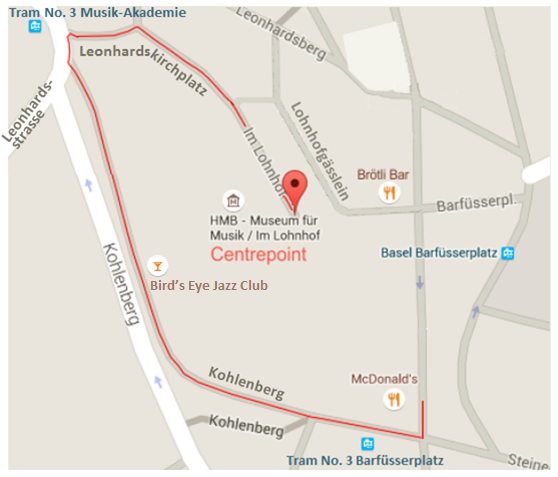 Walk through the arch and you will see the entrance to the Museum für Musik on your right. Walk through the Museum entrance and immediately on your left, up four steps, is a door. By the door is a doorbell for Centrepoint. Ring the bell as necessary and, once the door is opened, turn right up the flight of stairs. Centrepoint is on the first floor. As additional help, the following is the Google Maps view of Centrepoint’s location, on which you can zoom in and out. Please note: Centrepoint is based on the first floor and has no lift. The building is accessed by steps and stairs, so is not suitable for people with limited mobility. If you bring children using pushchairs, you can leave the pushchair in a shared, unsecure lobby, at your own risk. Dogs are not allowed in the building and there are no facilities to leave dogs outside.